Hey, it looks like folks might have underrated a Chris Holtmann coached Ohio State team. Who would have thought? The freshmen looked poised in a hostile environment to start the season. 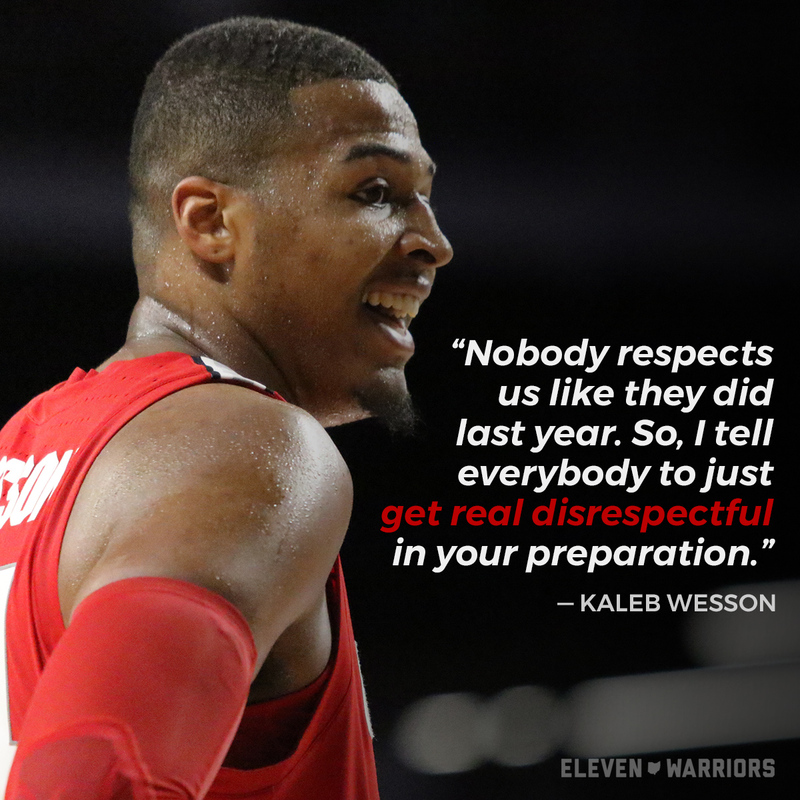 Chris Holtmann wanted to see how his team would respond to adversity, and they came through. After overachieving last season, Chris Holtmann knows the margin for error is smaller this season. A complete roster breakdown for the 2018-19 Ohio State men's hoops team. Poking fun at the College Football Playoff Committee's ranking system. Word of the Day: Frisson. GET DUMPED THEN, CINCINNATI! I'll be honest, I never for a second expected this Ohio State team to go down to Cincinnati for the first time since 1920 on opening night in a newly renovated arena in front of a student section with a massive inferiority complex and actually win the damn game, but here we are. Ohio State pulled it out at the end, even if it was a little too close. But honestly, it shouldn't have been, because the Buckeyes outplayed Cincinnati by a pretty wide margin, especially in the second half. I've been saying this all offseason, but it's just reckless as hell to doubt Chris Holtmann at this point. And if he can achieve what he did with last year's team and then have this team dumping power-five teams on the road to start the season, folks should be terrified of what's coming next year. Hell, after that performance, I guess they should be scared this year, too. More than anything else though, this team seems just as fun to watch and follow as last year's squad, which is really all I could really ask for. EDDIE DIAGNOSES THE BUCKS. A few months ago, Eddie George was saying this could be the best team in Ohio State history, but now it extremely switched and he's just trying to out what the hell went wrong just like the rest of us. "I wanted to them to come out and perform extremely well coming off the bye week and the horrific loss against Purdue, but I thought coming off the bye week and playing the way they did in West Lafayette, I thought they would come out with their hair on fire and something to prove,” George said during Tuesday's appearance on SiriusXM. “But these guys didn’t look well. Couple things came to mind was there’s something going on there that we the public don’t know. I feel like, My personal opinion, there’s a level of dysfunction there within the walls of Ohio State. Whether it’s with the coach, the administration, the coaching staff … something is not right. I can’t put my finger on it and I don’t know exactly what it is. "The way this team looked under Urban Meyer … I’ve never seen this team not be prepared for a game, fumbling the ball everywhere. They weren’t dialed in mentally. I couldn’t put my finger on it. It tells me something isn’t quite right there, especially jumping into November football. This is when you make your claim to be one of the four teams in the Playoff. I definitely think Ohio State has regressed a lot since the beginning of the year." I don't know whether its encouraging or disheartening that a Heisman Trophy winner has observed basically the exact same things about this football team as 85 percent of the fanbase and arrived at almost the exact same diagnoses. The good news is, Eddie doesn't think the Buckeyes are cooked just yet. Asked during the same interview if he thinks this year's Ohio State team is good enough to win a national championship, George didn't back down. “Once you get into the Playoff, anything can happen,” he said. I mostly agree, it's just that the whole "get to the playoff" thing seems like it might be a problem. There are some folks, like Joel Klatt, theorizing Ohio State might not make it in the playoff even if it ran the table, arguing that the Buckeyes have been so lackluster the past few games they'd have to look like a completely new team in these next four. But my belief is that Ohio State ain't winning its next four games without looking like a completely new team anyway, so that argument is kind of moot. TACKLING PROBLEMS. You don't really need stats to tell you that Isaiah Pryor has had a rough year, but I'm giving you one anyway because it's just ridiculous. Potential factor in OSU safety battle is missed tackles. Pryor literally misses a tackle more than every third time he has the opportunity to make one. So basically, if a team designed its offense to run directly at him every single play for four downs, they would have an 84 percent chance of him whiffing on one of those tackles, by my math. CAN THE REAL MICHAEL JORDAN PLEASE STAND UP? Ohio State center Michael Jordan is not the only athlete with that name, sharing it with an extremely popular minor league baseball player from the mid-nineties. That's caused some slight confusion at times. We've heard the story about Jim Harbaugh picking up his cell phone in 2015 to find Michael Jordan on the other end. As the Michigan football coach told it at the time, his phone cut out and he had to get clarification as to it was. Now, more than three years later, Harbaugh is telling the whole story. He thought it was a football recruit. "There was another player we were recruiting at the time named Michael Jordan, who was an offensive lineman," Harbaugh said Tuesday on "The Dan Patrick Show." "He plays for Ohio State now. But yes, at the time we were recruiting Michael Jordan and there was of course Michael Jordan. "I was like, 'Which Michael Jordan is this?'" You'd expect having that name to play in his advantage at least once in his life, but Jordan could only think of a time when it actually cost him. HARBAUGH FOR HALLOWEEN. Apparently, a ton of misguided folks really wanted to go as a quirky dude in khakis for Halloween. It's crazy people actually felt the need to put effort into that costume. I dress as a dud who's winless against Ohio State every day. Ain't nothing special about that.